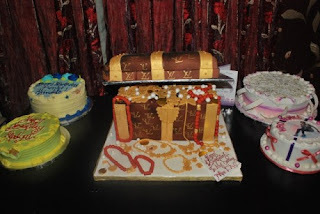 On August 24, 2012 star actress Funke Akindele a.k.a Jenifa turned 35 and her hubby Almaroof Oloyede, celebrated his wife’s birthday in grand style. 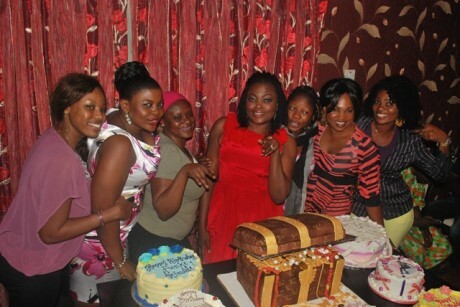 Mr. Oloyede held a classy party for Funke that had close friends and family members in attendance. Dressed in a bright red dress with ruffles, Funke smiled as she posed with her five different cakes, the most elaborate of which was the Louis Vuitton cake. Here’s wishing the talented actress long life and prosperity.